The lotus speaks to me because it grows in shallow, muddy waters. It’s rooted in the mud, grows through the water and blossoms above the water’s surface with a bloom that is untouched by the muck below it. Lotus flowers regularly blossom 8″ or more above the surface of the water. Seems like a metaphor for life. While you are rooted in the mucky, day-to-day stuff, the beauty is in rising above your situation and blossoming anyway. 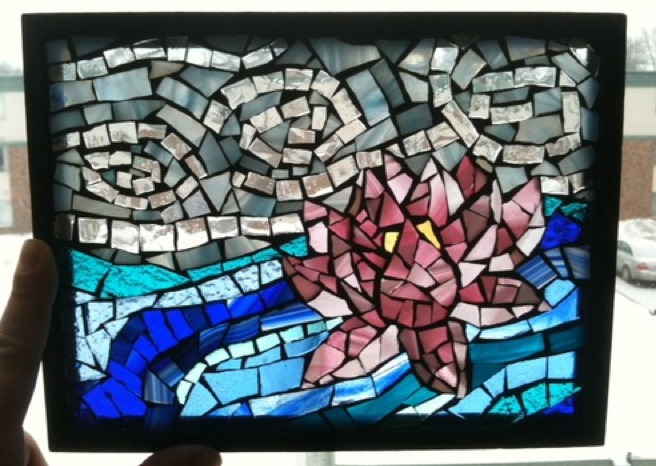 So, that is “Lotus.” It will be on display at Art-A-Whirl in May! This entry was posted in Finished Work and tagged Finished Work, lotus. Bookmark the permalink.